Aaron Tveit poses for a photo with fellow Broadway star Laura Osnes at the launch of The X Magazine on Monday (September 25) at the Todd Snyder flagship store in New York City. The 33-year-old actor is featured on the cover of the magazine’s first-ever issue and Laura‘s husband, photographer Nathan Johnson, is the one who shot the photos! Also in attendance at the event were Broadway actors like Ciara Renee, Jay Armstrong Johnson, and Adrienne Warren. Aaron was seen mingling with designer Todd Snyder and the mag’s editor-in-chief Tony Marion. Rachel Lindsay & Bryan Abasolo Are a Stylish Couple at Badgley Mischka NYFW Show! 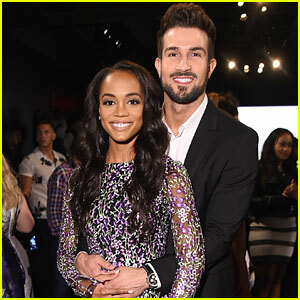 Rachel Lindsay and Bryan Abasolo are a perfect fit at the Badgley Mischka show! The engaged Bachelorette couple sat in the front row of the New York Fashion Week event at Skylight Clarkson Square on Tuesday (September 12) in New York City. Bryan and Rachel were seated alongside several stars at the event, including actress Alfre Woodard, Skai Jackson and J. Alexander. Designers Mark Badgley and James Mischka mingled with attendees including Larsen Thompson, Broadway actresses Rachel Bay Jones and Laura Osnes, Laura‘s photographer husband Nathan Johnson, as well as tennis player Madison Keys. Priyanka Chopra wears a pink dress while attending the Altuzarra fashion show during New York Fashion Week on Sunday (September 11) at Spring Studios in New York City. The 34-year-old actress was joined at the show by Empire‘s Jussie Smollett, Olivia Palermo, and fashion insiders Derek Blasberg and Carine Roitfeld. Priyanka took some time to visit the 9/11 memorial that day. “The 9/11 memorial on 9/11.. It’s powerful. #stoptheviolence,” she captioned the below Instagram photo. Also pictured inside: Broadway star Laura Osnes (with husband Nathan Johnson), Sophie Simmons, Megan Nicole, and Jessica Pimentel attending the Carmen Marc Valvo fashion show that same day at Pier 59 Studios.